Home / -Preview- / Preview / Rachel Sage / Preview: Rachel Sage Announces New Album "Myopia"
Preview: Rachel Sage Announces New Album "Myopia"
Singer-songwriter, multi-instrumentalist and producer Rachael Sage has announced the release of her forthcoming album, Myopia, out May 4 via MPress Records/ILS/Caroline. In anticipation, Sage has released the first single “Olivia” via BlackBook. Listen and share “Olivia” and pre-order the album via Pledge Music. 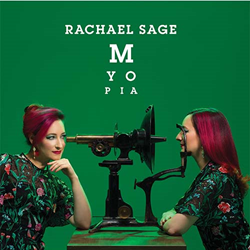 Produced by Sage and her longtime engineer John Shyloski, Myopia was recorded last summer at Carriage House Studios in Stamford, CT as well as at Sage’s home studio in NYC’s East Village, and you can feel the swelter. The heavily electronic "Haunted By Objects" – on which Sage plays Moog synthesizer – describes the psyche of a hoarder whose only potential recourse may be to set everything on fire, while "This Darkness", a bluesy lamentation about the Dakota Pipeline, reflects the urgency and courage of Native Americans’ resistance to environmental desecration; the enemy in the dark is indifference, the iciest kind of blindness. Sage is continuing her tour opening for Howard Jones with dates still to come in New York City, Boston, Cleveland, Chicago and Detroit. Fans will be treated to special selections from Myopia. Violinist Kelly Halloran (Tom Morello) will be accompanying Sage for all of her performances.